In the Ming and Qing dynasties the aristocracy as well as civil and military officials wore rank-defining badges on the front and back of their robes. The front-facing dragon would have been worn by a Prince of the Blood, who had been granted the right to wear the five-clawed creature by the emperor. 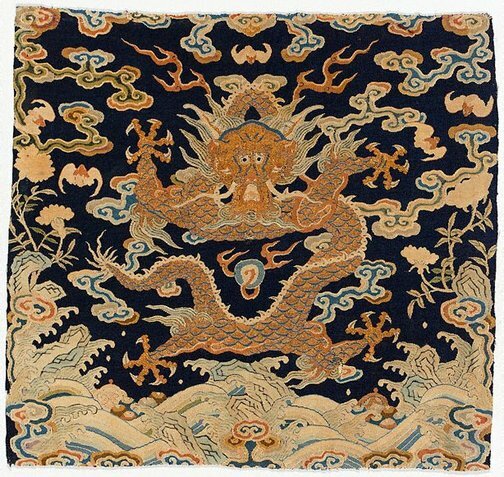 The rich motifs include the rocks, the waves and the cloud representing the earth, the sea and the sky symbolising the universe, and the peony, bat and lingzhi (magical mushroom) symbolising nobility and longevity. Asian Art Department, AGNSW, January 2012. The Asian Collections Art Gallery of New South Wales , 'The Marvel of Porcelain', Sydney, 2003, 126 (colour illus. ).